Even his 'ghosts' were scared! A major attraction at the site of the largest travelling funfair in Europe is under the watchful eyes of ghostwatchers today, after an unexplained occurrence at Hull Fair. Hull Fair first appeared in the city in 1278, and then annually from 1293. The Ghost Train ride has been a firm favourite there since the late 19th century, and can always be relied upon to scare revellers, and to make them soil their underwear. At around 9pm yesterday evening, however, even the Ghost Train's eccentric owner, Harold 'Spooky' Spook, was spooked when customers on the ride - which has a collection of ghostly images that light up, students dressed as 'ghosts', murals of witches, bats, and vampires, Frankenstein and Dracula puppets that tumble from the ceiling, flashing lights that reveal 'skeletons', and gigantic hanging webs inhabited by furry, black spiders - had the shock of their lives: they saw a ghost! The ride was approaching its halfway stage, when an apparition - a child in a bloodsoaked white dress - drifted along the 'train' from front to back, passing through the passengers as it went, leaving an eerie scent. Two people mentioned 'ectoplasm', but this may have been something left on the seat earlier by other passengers. "It was terrifying! She went right through me. I didn't just see her, I smelt her as well!" "One moment, we were screaming with excitement, and the next we were screaming with fear. Although, one might say, they are both the same thing, or, at least, parts of the same thing. I think it needs more research." "Ah've worked 'ere for nigh-on sixty year, an' ah can tell ya, ah've never 'ad so much as a sniff of anythin' supernatural. 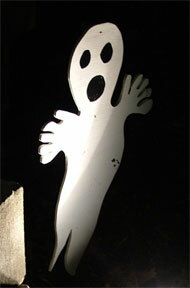 Even me own 'ghosts' was petrified!"